PN Netanyahu says he will sue leaders of Blue and White party for libel. Lapid: Go ahead. Sue me. “The call of ‘traitor’ against me by [Yair] Lapid, [Benny] Gantz and Ya'alon is a serious incitement that must not be ignored,” Netanyahu said in a video posted to his Facebook page. “The lies of Lapid, Gantz and Ya'alon are crossing a red line on the most sensitive issues concerning Israel's security. Therefore, I instructed my lawyers to sue them for libel,” added the Prime Minister. Netanyahu said he would also have sued Lapid, but that Lapid has parliamentary immunity as a sitting MK. Lapid later published a video of his own in which he declared he would remove his immunity and invited the Prime Minister to sue him as well. “You know very well that not me, not Benny Gantz, not Bogie Ya’alon and not Gabi Ashkenazi called you a traitor in the submarine affair,” said Lapid. Last November the police published its recommendations following the conclusion of the investigation into the submarine affair. The recommendations stated that evidence was established for the prosecution of six senior officers who were interrogated in the affair. 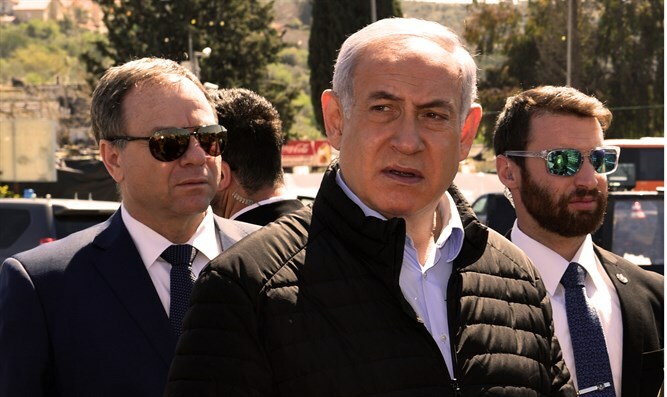 Among the senior officials are Prime Minister Binyamin Netanyahu's close associate and personal attorney David Shimron, Netanyahu’s former bureau chief David Sharan and former Navy commander Maj. Gen. (res.) Eliezer Marom. At the same time, it was determined that there was no evidentiary basis of offenses against Netanyahu's personal envoy, Yitzhak Molcho. Police have also stressed that the Prime Minister is not suspected of any connection to the affair.